Comments Off on Plastic bag ban backflip backflip: Coles the supermarket gymnast. Oh, I am more than a little annoyed. But BUGGER IT, I AM BLOODY CRANKY. You are a bunch of big whingeing entitled waste babies. Coles, all you had to do was get your message right. You even had a scapegoat, for Uma’s sake, since the plastic bag ban IS LAW. And people. You big waste babies. All YOU had to do is REMEMBER TO CARRY YOUR OWN GODDAMN BAG. Yes, Coles, you are freaking commercial cowards. But, this time, blame doesn’t rest solely with the big guys. Because I’m sure those “reuseable” thicker plastic bags cost a stack of a lot more than the thin grey turtle killers. I guess this current situation is not your ideal choice, either. Your stupid competitive approach, rather than collaborating with Woolies on this issue, has done you in. No, wastebabies, this one’s on you. Con-freaking-gratulations, you win. You’ve taken a positive piece of legislation (here in Queensland) and MADE THINGS WORSE THAN BEFORE. ‘Cause look around – do you see many of those “reusable” bags walking with their big wastebaby owners back into Coles? You asked for it, no, demanded it, when you whinged and whined and bullied checkout operators for the plastic you see as your entitlement. Over the past week, I have visited an Indian takeaway in West End, a bakery in Highgate Hill, and a general store in Darra. Each of these establishments displayed a sign at the counter, prominent and at eye level, stating that because of the new Queensland law, they could not provide plastic bags, but a “reusable” bag could be purchased for ten cents. Yet, at each of these three stores, the assistant automatically moved to place my purchases in a plastic bag – without even asking me, and definitely without asking for ten cents. Why? My guess is to avoid the hassle/drama/angst/abuse they’ve been copping from customers, those wastebabies who feel that somehow they are missing out on their free plastic bag entitlement. So these small businesses now absorb a fee that their customers should be paying, a fee designed to encourage people to remember to carry a bag into a shop. Even if Coles stops giving out free bags at the end of the month, will all these smaller businesses cop it? Lose, lose. It’s not as if Australia is leading any plastic-bag-free charge here. (South Australia, maybe.) Dozens of countries have instigated bans or levies over the past decade or so. Bangladesh was the first, after plastic bags waste contributed so seriously to floods in that country. For Bangladesh, it was, literally, a life-and-death decision. Where? When? Ban or levy/tax? Apart from being a decent and conscious human being, yes, I have historical skin in this game. In 2012, I accepted a contract to work with an environmental organisation to coordinate a campaign designed to remove free plastic bags from shops in Queensland. When I began, the fledgling campaign had been tentatively named “Ban the Bag”, but in the interests of a more positive approach, I changed this to “Plastic Bag Free Queensland (PBFQ)”. It was my first engagement in the environment sector since 1989, when I worked at the incipient Brisbane office of Greenpeace Australia as one of their original volunteers, helping launch the “Adopt-a-Beach” campaign. This, the first Greenpeace campaign for Queensland (somewhat presciently) involved cleaning up waterways and beaches in a forerunner to the excellent work now done by organisations such as Tangaroa Blue. 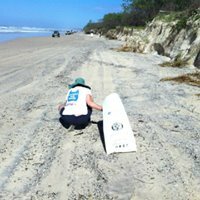 Like Adopt-a-Beach 20-odd years earlier, PBFQ was launched with a function on the shores of Moreton Bay, as marine impacts were (and are) one major reason why the removal of plastic bags is so important. More on that, elsewhere*. Clean Up Australia’s legendary Ian Kiernan AO joined John Phillips OAM from Keep South Australia Beautiful to help launch the campaign. Within months, an online community of over 2000 supporters rallied. Key public figures from Bindi Irwin to Michael Zavros pledged their support. Chef Ben O’Donoghue donated a day of his life to film a fantastic short film called “Gutful” thanks to the generosity of Phil MacDonald and his team at GPYR. No less than three Australians of the Year (Kiernan, Peter Doherty AO, and Ian Lowe AO) joined supporters Nick Earls, Veny Armanno, Jessica Watson, and many others. The PBFQ position was not without its challenges, and not just the political climate in which it dwelled. I’d brought my inner teenage environmentalist along to the gig, and her naivety was tested by office bullies and personal politics. I was working in an unwell organisation. In addition, I experienced a little shades-of-green environmental angst. A certain corner of the movement felt that plastic bag ban campaigns were a misguided use of limited resources that should be directed towards serious, pressing “dark green” issues such as climate change. I understand the validity of this argument. However, in an interesting discussion with Ian Kiernan, I saw how waste issues could be considered a gateway to a deeper form of environmentalism. His philosophy was that waste is tangible to all (eventually, even those who forget their reusable supermarket bags), and that an awareness of the waste that we produce as humans leads to an awareness of our environment in general, and our impact upon it. When you realise “there is no away”, you question much of our consumerism and disposable society. PBFQ was smashed to bits in a single morning. A new import, a right-leaning editor of the state’s newspaper got wind of a discussion paper (considering a possible plastic bag ban or levy) being considered by the LNP government. His front page dog-whistle (the incorrect and histrionic “Shoppers will be slugged $2 for a bag”) to the premier was answered by Newman’s unilateral decree “There will be no slug” – which he announced immediately, without any cabinet consultation (Welcome to Queensland). Death by slug. And a certain mindset of plastic bag entitlement was strengthened, a progressive opportunity lost. 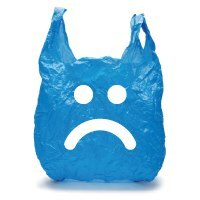 Why do people think they are losing some basic right when losing access to free plastic bags? On a distant acquaintance’s Facebook, I read a boast about how she just “used lots of those produce bags” to get around the ban. Really? What an effort. How about applying that energy towards carrying a big reusable bag? Whatever would you do with all those bags afterwards? I guess they’d go straight in the bin, being too small for much else. One main reason behind removing free plastic bags is to prevent them from escaping into the environment, particularly the marine environment. They’re slippery little suckers. Granted, when they are wrapped around household rubbish, they’re less likely to blow away. But is this even necessary? Oh, please. I’ve been having this friggin conversation for six years. I guess another hour won’t hurt. You don’t need to line your bin. Simple. Got a hose? Dump the kitchen bin into the big bin, and hose your kitchen bin out. Too icky? Put a bit of newspaper at the bottom of the bin. Or junk mail. Or scrap paper. Use bread bags, or pasta bags, or juice cartons, for the meaty/messy stuff. Make compost with your scraps rather than putting them in the bin. I’ve had two healthy worm farms on tiny unit balconies; it’s not hard. Wrap rubbish in newspaper if you’re in a unit and need to put it in a chute. Really must line that bin? Then buy a goddamn bin liner. You’ll still use less plastic if you take your own bags to the supermarket and buy bin liners. Look for compostable, not just degradable. Bags labelled biodegradable bags are frequently still plastic, and still stay in the environment for 1000 years. In ACT and SA, sales of bin liners, it was reported, did increase a little after the plastic bag bans – but not as much as expected. And in ACT, bin liner sales actually dropped, as people looked at other options. And even if bin liner sales HAD increased by 100%, this is nothing like the amount of plastic supermarket bags that had stopped being handed out. The South Australian government estimates that their ban has saved 400 million bags annually. Happy birthday! Taking part in a beach clean up on Moreton Island, May 2012. *For more information about the impact of marine and other impacts of plastic bags and other plastic waste, here are a few links. At risk of being outed as a tragic old hippy, I’m mourning a tree. Again. This tree-mourning, I’ve only just realised it even happens. This time, this tree. It wasn’t even a significant tree, or a pretty tree, or even my tree. Just a big, old tree. My neighbours, I like them, and I think they thought I’d be happy to see it go. Its absence would impress real estate-y types. Our outlook has been, they would say, enhanced. The aspect to the north-east has opened substantially with the tree’s departure. Property values probably up up up. Whoopee. It was an old pecan, too tall for us to reach any nuts (but the cockatoos could). Some of it was dead, but not all. And when the branches were all stacked on the truck on Saturday, when they were cut and stacked to be taken away, you could see all its little spring buds ready to burst. As it transpires, never to open, but ready anyway. As a deciduous tree, it did us all a favour, keeping a few houses in a row cooler in summer and letting winter sun through. It’s not the first tree felling to make me sad, but I’ve only just named these individual sadnesses as actual mourning. The old fig up the coast at my folks’ house, the one that cooled and protected a garden and homed birds and bugs and green tree snakes… whole bloody communities of critters. Cut down by its “owner”, and we’re not quite sure why. It’s hot up there now, in that yard. The common mango in my street. The big old school fig, 120+ years old, lost in a storm; the same storm took some of the figs down near the river, including the one with the secret cave that my boys and their friends liked to hide in. The leopard tree at the house I grew up in, planted by one of the first families in the area, maybe the first exotic in Sherwood. I used to look out my bedroom window and watch kingfishers nest in its fork, as a teenager. The 60-year-old magnolia we lost in a drought. When these big trees go, it’s rare that anyone checks them for nests first, and this makes me sad, too. There’s this guy who lives in my street. Called Dutch. Rides a motorbike. Looks like the type of cat who’s already gone through a few of his nine lives. Lives in the front half of a rented place at the bottom of the hill. Dutch, of course, is not his actual name. I don’t know what name he was given at birth. I asked him once; he laughed at me. I don’t know how long he’s lived in this street: longer than us, probably quite a long time. He’s good for a chat. 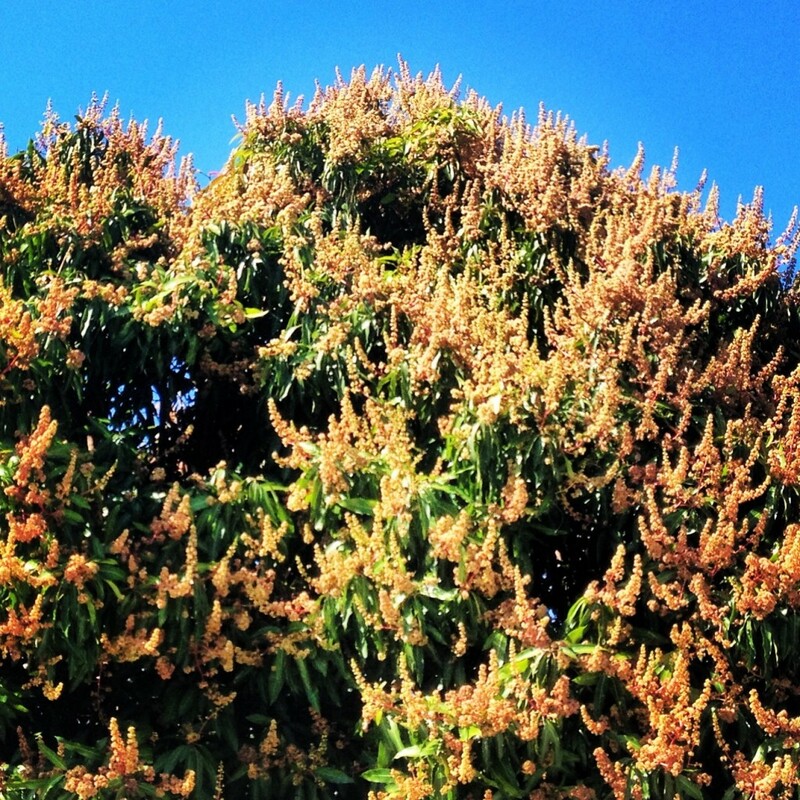 Out the front of Dutch’s place was a magnificent gnarly old tree: one of those old-school no-nonsense common mangoes. The kind whose fruit is good for Asian salads and daiquiris, but too stringy to eat straight up, compared to designer mango brands trucked down from FNQ. This tree, a densely canopied beauty whose blossoms cranked the birds, its leaves threw the coolest shade. Dutch, you could tell, Dutch was proud of “his” tree. (It seemed quaintly contra-character, the way he called it “my tree”. Un-tough.) It’s how I met him, originally – I think it’s how half the neighbourhood met him – when one summer I picked my way through the bike parts decorating his front path to ask if I could please pick some of the green fruit to make a salad? It became a summer ritual, picking Dutch’s green mangoes. Heaps of the neighbourhood did it. I made salads (Dutch’s mangoes were always in a salad on our Christmas table); some made pickles. Standing on the footpath outside, I once watched a cheeky Vietnamese woman drive up, park underneath, and unload the branches from the bonnet of her car. Last year, Dutch’s neighbour stood on his own car bonnet to pick late-season fruit for me. It was Dutch’s conduit to the community. A sweet crack in tough-guy exterior. And mangoes for all. This year promised to be the best yet: just last month, the tree was so fecund with blossom I stuck a picture of it on Instagram (it wasn’t very good). We were excited. Then this week, walking down the street, I become muddled in my bearings. One of those shaky virtual-reality moments slows my feet, and I stop outside a house I can’t quite recognize. The massive old mango has vanished. Later, I see Dutch, ask what happened. He looks sad. He says he has no idea. Woke one morning and “a couple of tree guys” were on his front lawn. Someone had complained about the tree to his landlord. He didn’t know what sort of complaint. Blossom dropping? Says if they’d just spoken to him, he would have taken some branches off the front if they were in anyone’s way (they weren’t) – it’s what he did each year, just hadn’t got around to it this year. Says he wishes his landlord had spoken to him about it. Says he’s not sure what to plant in its place. Says he thinks it might get a bit hot, his house, this summer. We discuss the tree’s unprecedented blossom this year. Shake our heads. I say I have a frangipani in a pot, if he wants it. The November sun, glaring across his bare front yard, hurts my eyes. With current “big issue” blows hitting our environment both north and south (dredging spoils in the Great Barrier Reef, winding back Tasmania’s World Heritage areas), talking about litter may appear trivial. Yet our planet suffers from the cumulative effect of discarded waste: items like plastic bags and balloons. And we can do something about it. Some of this waste can be avoided, but it will take awareness, effort, and probably legislation. Late last year, a petition lodged in the Queensland Legislative Assembly called for a ban on the mass release of helium balloons. Talk about unlucky timing. The story suffocated underneath the silt-like slurry of the week’s big environment story, that Environment Minister Greg Hunt had approved the major expansion of a coal port at Abbot Point. In comparison, balloons seemed beyond trival. The issue didn’t even raise enough hot air to rustle up the usual chorus of “nanny state” calls. 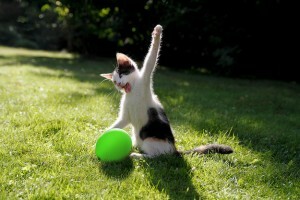 But the balloon release campaign raises an important – if not so eco-dramatic – point about sustainability. Rubbish. Particularly, legitimising litter. What happens when balloons are released? Don’t they just go up, up, and away? Away? There is no “away”. A flock of balloons makes pretty litter. They rise. Some fall to land or sea whole. Others shatter at altitude, and smaller pieces return. Industry asserts these fragments are benign. The phrase rolling around the Internet sounds like this: “Balloons decompose at the same rate as an oak leaf.” The balloon lobby has been enlightening local councils with this nugget since the late-1980s, when this “oak leaf” study was commissioned. (By Du Pont.) A researcher dried balloon pieces then left them outside, in earth and in water, for six weeks. The balloons did not decompose completely by the end of the study: they broke into smaller pieces. Last year, at the University of Queensland Moreton Bay Research Station on Stradbroke Island, I observed Honours student Lauren Roman conduct necropsies on seabirds found dead along the coasts of Queensland and northern NSW. These birds showed signs of malnutrition. All had plastic fragments in their stomachs. Some contained pieces of balloon. One shearwater’s gut was so full of balloon fragments they had backed up its esophagus. I do not doubt that this bird starved to death because its stomach was stuffed with fragments of latex balloon, leaving no space for real nourishment. Balloon debris is deadly litter. But hang on. My kids have a right to fun and wonder. My loved ones have a right to celebrate my life by releasing latex helium-filled balloons at my funeral. Banning balloons? That’s demonising the universal symbol for “party”. What’s next for the fun police? Face painting? It’s not about the actual ban, he adds, rather a knock-on “perception that helium balloons are bad.” BASA wants to do the right thing. Their guidelines encourage responsible releases: no plastic ties, degradable string. They also want to sell balloons. Addressing the petition, Environment Minister Andrew Powell acknowledged balloons “have potential to create an environmental impact… (particularly) in the marine environment where they may be eaten by turtles and other animals.” Powell’s position is that a ban is not the best way to address this, preferring to invest in “education and awareness, along with partnerships with industry sectors and peak bodies such as the Balloon Artists and Suppliers Association” as the most effective way to reduce balloon litter. However, Blum concedes that, at 26 members, BASA does not have the ears of the large majority of balloon suppliers. With such low industry representation, the government would not be dealing with the majority of balloon sellers. Keep Queensland Beautiful CEO Rick Burnett believes this is a litter issue. “Helium balloons are litter about to happen,” he says. “Litter is an environmental problem that is growing with population growth and lack of awareness. Helium balloons are one of many forms of litter.” New South Wales banned releases of more than 20 balloons years ago. So has the Sunshine Coast Regional Council, due to concern about the impact of balloon debris in the marine environment. Superfluous regulation is this government’s avowed bête noir. (Unless, of course, you’re a bikie.) The Environment Minister doesn’t want a ban. Yet legitimising the mass release of helium balloons by NOT banning them gives a covert message to the public that it’s ok to litter. Balloons are not bad. Letting them go is. I’d extend a ban to halt handing out free helium balloons for any public promotion. Did anyone who attended last year’s Ekka count the number of escaped LNP balloons rising skyward? I gave up at 50. Where did that litter all go? Even BASA concedes that balloons escape. Of 1500 balloons they handed out a recent tunnel launch, Blum counted 113 on the roof of the tunnel a couple of hours later. Lucky the tunnel had a roof. Releasing helium balloons is littering. We prosecute other forms of littering. Why legitimise this shiny one? Caroline Gardam is a Queensland writer and ethical marketer. Last year, she worked with Queensland Conservation to launch the Plastic Bag Free Queensland campaign. These first leisurely days of 2012 have seen a few leftovers from coastal New Year’s Eve celebrations washing up on the beach. While walking, I’ve collected balloons in various states: from printed “HNY!” remnants with tendrils like a jellyfish to the full (deflated) monty. I’m suprised more coastal councils don’t follow the Sunshine Coast Regional Council’s awesome lead, to ban the release of helium balloons. Call me a killjoy, but I get angsty just seeing kids’ parties at picnic spots beside rivers and beaches, decorated with balloons all itching to break their moorings and head downstream. Because escapee balloons join all that other lovely plasticky stuff that pollutes oceans and kills marine life. Contrary to what some balloon manufacturers claim, a lot of these balloons are still pretty intact when they hit the water; they’re a decent enough size to put a fat pile of appetite suppressant inside a turtle’s gut. Because balloons act just like plastic bags, and help starve a turtle by filling their stomach with inedible badness. I know they’re fun. Yep, kids love them. I’ve been known to blow a few up in my time, inside, at my kids’ parties. Not, however, near a waterway. So if you ever see a strange woman cutting down, and binning, abandoned balloons at the picnic area of your local beachside picnic spot, I trust you’ll understand, and maybe even approve.